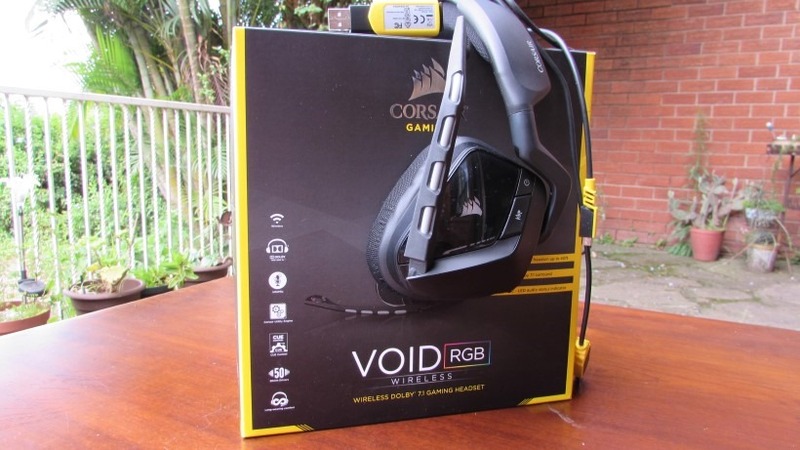 The Corsair VOID represents the latest in that brand of headsets, which much like the Vengeance range, offers very similar aesthetics and designs with different tiers of technological features added in. Expensively named the VOID RGB 7.1 Wireless edition, you’d imagine having to call one’s banker to shift some offshore investments around for a down payment for one of these. You’d be mistaken though, since despite the long list of features, the Corsair VOID RGB Wireless edition has managed to maintain some value proposition. To be fair, a chunk of that value was eroded by recent weaknesses in our leaders, currency and economy. Just a few months ago, you could purchase this particular Void for R1600. Thanks to governmental gaffes and third world currencies taking knock, it’ll now set you back around R2000 at the time of writing or slightly less (Thanks, Zuma!). 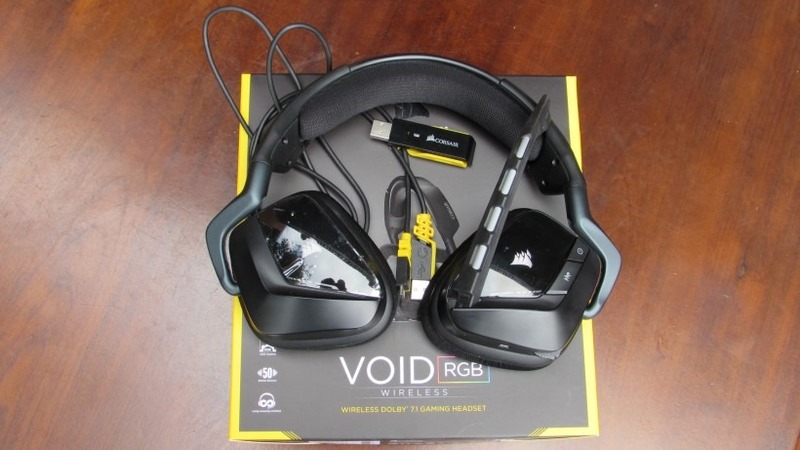 Regardless, let’s find out if the new Corsair VOID RGB Wireless 7.1 headset can fill that void between your ears with some awesome audio, or if it’s something you should aVoid entirely. I heard Geoff hates puns, so I’m making it my mission statement to use them profusely. Does This Void Look Fat On Me? The Corsair VOID series generally share the same design, layout and build quality. They also share some of the underlying technology and features in the form of 50mm neodymium drivers, physical audio controls and RGB lighting. The move to design standardisation has some cost benefit for Corsair and choice benefit for the gamer, since the gamer need not overly concern themselves with the looks and build quality at the different price points so much as the underlying wants of their setup and connectivity options. The VOID is not what we would call large, but it does appear bigger due to the angle of its oversized and unconventionally shaped forward-slanting ear cups. It garners an aesthetic that is quite intimidating and aggressive, almost Spartan like – and although the “colour” is only black and grey, the addition of a striking yellow wireless dongle and charging cable does spruce up the package. The hardened plastic cups feel sturdy, and I love the smooth indents and lack of sharp corners. The glossy finish does attract fingerprints, but it also enhances the 16.8 million RGB lighting. 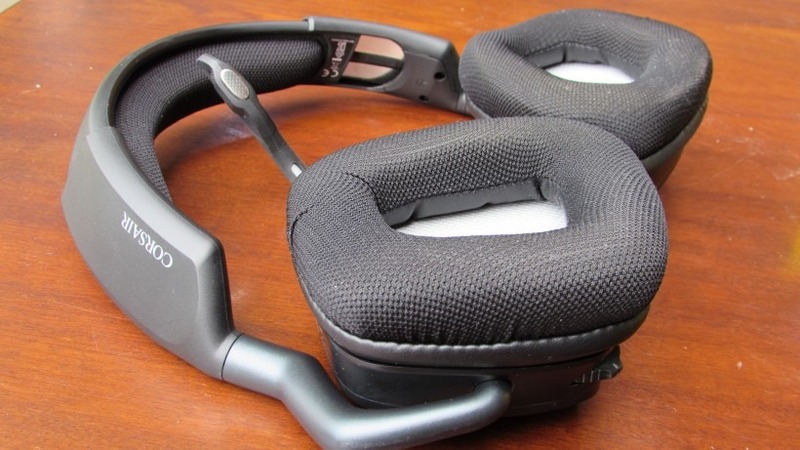 Kudos to Corsair for using premium aluminium in high tension areas, such as the reinforced headband and the entirely blackened swivel mechanism that connects the ear cup to the headband. Although somewhat wobbly, the headset is robust and sturdy, all the while being one of the most lightweight headsets—wired or wireless—that I’ve personally used. 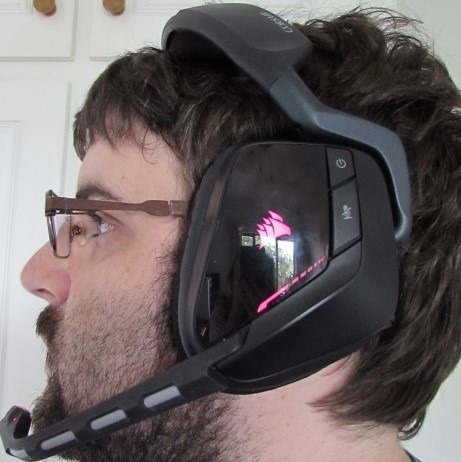 Corsair uses a soft cloth-based lining for their ear cups (the same as used on the extendable headband), and although we would have liked a pair of leatherette linings, the cloth is still soft and not scratchy at all. The non-removable set-and-forget boom mic is a treat. I’ve always preferred a boom based microphone since removable ones have that extra chance your cat might one day decide she wants to DJ with it…outside…in the mud. Trust me, I know this pain. Corsair have implemented a few nifty notifications into the “InfoMic”, in which little red and green LED’s are used to notify you about battery levels, Mic Mute status, battery life or audio profile changes. Their effectiveness, however, is somewhat muted in that you can’t actually see the LED’s properly in your peripheral vision. Frustratingly there is no full documentation or links within the software to help explain the myriad of functions or notifications. 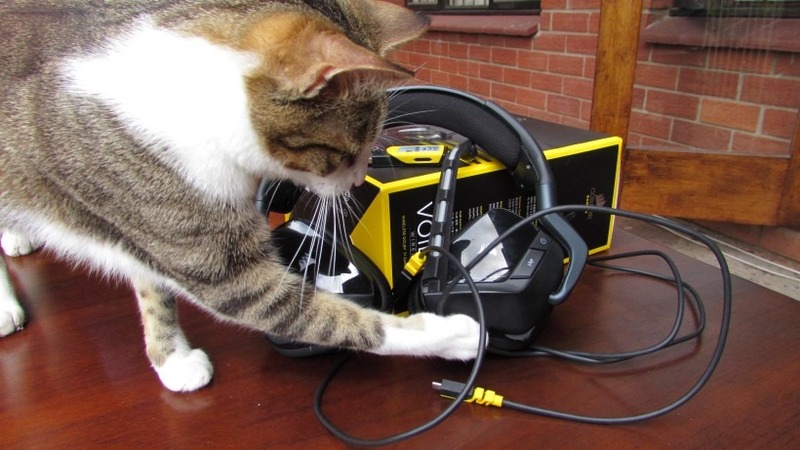 Although you can find one hidden away in an obscure blog post by Corsair. On the ear cups is where you’ll find the 16.8 million RGB LED lighting, where the trademark Corsair sails shine above what could have been a slick battery charge indicator. Spoiler: it’s not. LED lighting on a headset is what some might call pointless, but in our streaming/youtwitfacing world, having RGB lights on your headset makes some semblance of sense. On the left cup you also get a Mic Mute button and On/Off switch. The buttons are close to each other, but they’re at different heights, so cross pressing was not an issue at all. On the underside of the left cup you’ll find the volume,profile and 7.1 rocker wheel button. This button does ALL THE THINGS: It adjusts volume, changes EQ profiles and turns the Dolby Virtual surround sound on and off — it’s a fantastic way to feel the in-game audio changes while not having to alt-tab to the CUE software. Sadly the Micro-USB port is only for charging and is not a data port which means the VOID RGB will only function with the included wireless USB dongle. On the software side of things, the brilliant Corsair CUE V1.15.36 is the most up to date version to use with the VOID. A recent addition in this version is Active Voice Notifications, which means whenever you change your EQ profile or turn surround sound on or off, a female voice lets you know which setting you changed. My Google Maps AI got noticeably jealous. 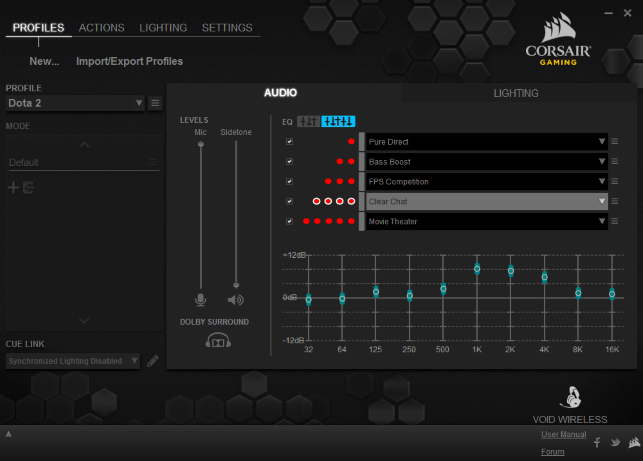 The software gurus at Corsair have provided the required virtual knobs and settings for amateur audiophiles to get stuck into, while also providing 5 default audio profiles for typical PC usage scenarios: FPS competition, Bass Boost, Movie Theatre, Clear Chat and Pure Direct. For those who want more control there is a basic EQ suite to create a sound profile to your liking. The microphone has a Sidetone feature which provides welcome audio feedback of your voice so that you check yourself before you wreck your friend’s ears on Teamspeak. Within the Settings tab you can download updates, disable lighting (why it’s here we have no idea), enable auto shutoff and check the battery life—also, admittedly, a weird place to put it. The Lighting tab has a few settings for the Info Mic, through which we can adjust the LED’s brightness or adjust battery warning light intervals. RGB settings like brightness, effects and speed can also be adjusted from here. There’s the usual allotment of lighting effects, but sadly there are limited RGB customisation effects for people with just the VOID; for more enhanced customisation you need to CUE-link to an RGB Corsair mouse or keyboard. 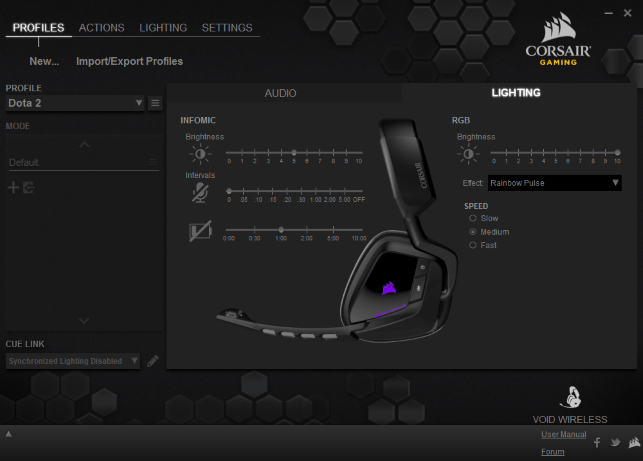 It seems you can only customise a lighting effect with 2 colours, which for an RGB Headset is a crying shame. The virtual 7.1 Surround sound is a virtual paperweight. I’ve dubbed it as the “Warehouse Effect” as it creates a warehouse environment with voices and instruments sounding muddied, distant and with a slight echo to them. In gaming (FPS gaming in particular) the surround sound does a better job at giving some positional audio advantage and some audio depth to the atmosphere. At a deeper level it affects immersion within games, something I experienced when galloping through a river in The Witcher 3. It produced an unnatural sound, almost sounding like a horse running through a puddle in an otherwise vacant warehouse. Forgiving the awful surround sound, the stereo sound performance is extremely strong. We mainly stuck with Pure-Direct for day-to-day usage and Bass Boost for gaming, but occasionally used clear-chat for podcasts. Using the Pure Direct pre-set, the headset delivers a neutral sound, which is surprising as gaming headsets are generally quite “bassy” off the bat. Mids and highs are adequate, but they do lack a certain crispness that limits the effect of background audio. Fiddling in the EQ does help a bit here though. The Bass Boost does emphasise grumbling lows over its mids and highs a touch, although it’s not overwhelming at all, giving punchy audio in gaming and movies. While listening to music I make use of the exquisite Dream Theatre’s 6:00 and Modest Mouse’s Bukowski to experience the full sound stage of the headset, and I must admit that regular stereo nailed it with flying colours—clean treble, clear mids and impactful bass. Not only that, but the volume on these cans was mightily impressive and I rarely went over 30% volume. Hell, you could even use them as a small speaker at 100% volume. Unfortunately the RGB VOID Wireless does not feel as comfortable as it should. Size wise it should have no problem fitting a wide range of ear shapes and head sizes, but the positioning of the ear cups and forward tilting headband make the headset rest awkwardly. 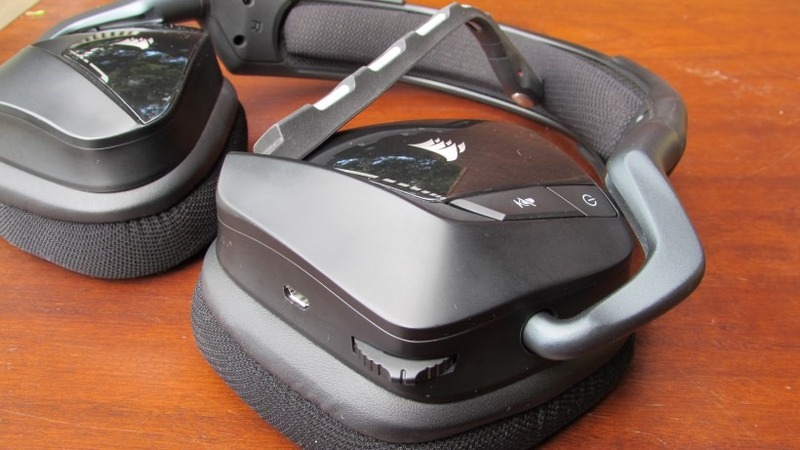 While cups shaped to fit to the contours of an ear sound good in theory, we found that they, and the forward slanting headband, made the VOID one of the loosest fitting headsets we’ve ever used. Not what we would call “natively” uncomfortable, their looseness made them “awkwardly” comfortable as simple head movements, like looking down to stroke Kitty, meant the headset slid down or shifted enough to make uncomfortable contact with your ears and need repositioning. Eventually I stopped stroking her, and she was not pleased. Regarding its wireless capabilities, we found there to be no hissing or interference and I was easily able to keep chatting to people on TeamSpeak while venturing to the kitchen to reload on snacks. The battery life is also something special, exceeding the 16 hour rating by Corsair with the RGB lighting turned off and a solid 10 hours with them on. Charging time is also very good, with around 3 and a half hours needed for a full charge, and a bit longer if you are using them while charging. The microphone is good and picks up your voice quite well, although it sounds distant and is slightly tinny, but is still clear in that there is no distortion. For regular TeamSpeak and Skyping sessions it will do perfectly. Just don’t expect professional levels of sound recording. As a lightweight wireless set of cans, Corsair has done a nifty job shifting some on-the-fly functions to the RGB VOID, without having to dig around in software for the simpler functions. As good looking and sturdy as these sets are, their weakness lies in their “awkward” comfort. Once accustomed to the feel of it and the movements you’re permitted to do, it should be mostly fine. Battery life makes it as Eskom-friendly as they come, and the wireless audio works without fault. Besides some FPS gaming, the 7.1 Dolby Virtual Surround sound is something to be mostly aVoided (nailed it), and I’d implore you to just stick to the superb regular stereo sound.